A black bulletin board with a recycled rubber tack surface provides an environment-conscious alternative to traditional natural and synthetic corkboards. Each board provides your community with a hub that serves as public information center. Mount these black bulletin boards in your office lobby or school hallway to keep everyone informed of current events. 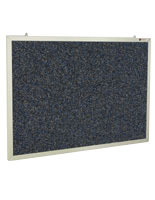 The wall mounted message boards feature durable aluminum frames that surround the recycled pinboard surface, which will not only last for many years of extensive use but will also look great. 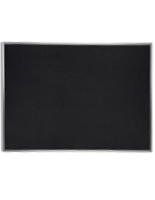 Similar black bulletin board displays are used in all kinds of buildings, from educational institutions like colleges and training centers to churches and religious organizations. Really any location that would benefit from a community forum can use a black rubber bulletin board. Of course, the attractive look and durable design are only a couple of reasons to purchased an eco-friendly bulletin board. The sustainable rubber materials used to make the black bulletin boards help lessen the impact on the environment by eliminating deforestation of cork trees. They also serve as a great alternative to synthetic cork materials, so it's easy to feel good about choosing a rubber bulletin board for your location. Whether you are posting notices and messages at a church, bank, hospital, retail store, school, university, or other location, you will be sure to make a statement about where you stand on environment issues! 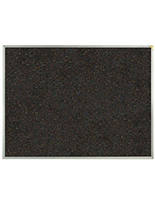 Black notice boards that feature recycled rubber surfaces instead of cork are not only a great alternative to more traditional options, but the eco-friendly material tends to last quite a bit longer than natural cork as well. This means that repeatedly posting notices, flyers, reminders, or other types of important event information will not wear down the surfaces. In a classroom, these environment friendly bulletin boards are great for hanging student projects, homework, or schedules. Churches use community notice boards to inform members about special events and mass or service times. Hospitals find these recycled tack boards with aluminum frames useful for listing directions to navigate through the building. The rubber notice boards can also display class listings for schools and universities. The applications are practically endless. 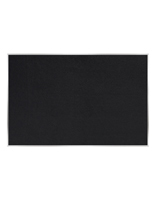 What are the benefits of using a black bulletin board with a recycled rubber surface? Protect environment and reduce pollution. 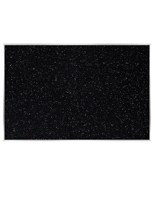 Serve as regular corkboard but better for the environment and offer increased durability. Raise the awareness of protecting the planet while positioning your company or organization as environmentally conscious. Make better impressions and connections with other businesses or organizations when using environmentally-friendly push pin boards. These announcement boards are the ideal bulletin boards one would want to use in upscale environments. Because the display surface is made from repurposed rubber, it is very light. The aluminum framework is also lighter than more traditional metals yet does not compromise durability. 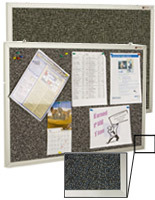 These notice boards can be used and reused, and the surface will not show push pin holes. The tough aluminum frame is rugged and will last for years but also looks very attractive in any environment. Unlike some other bulletin boards, the surface is resistant to mildew and moisture as well as fading. At these price, these units are a great buy for anyone on a limited budget! 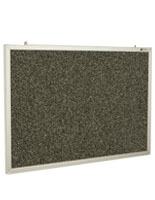 We offer cork bulletin boards in all kinds of sizes and styles. Browse our selection to find the right one for you or your business. Displays2go has been in business since 1974, offering POP displays in addition to thousands of other retail products. We currently have more than two million units in our warehouses to benefit your business. To see the rest of the product lines we have to offer, check out this online catalog. For shoppers that have inquiries or need further information regarding a product seen here; there are several consumer service representatives that are available weekdays from 9am-5pm EST. These specialists complete months of training on all of the products offered here. Another convenient method of contacting one of these agents is through the live chat feature listed on every product page. For more in depth questions or issues feel free to email us. For more than 40 years Displays2go has been a trusted source for quality displays and outstanding consumer service. We appreciate your business, and look forward to serving your needs again in the future.